Cultivate a healthy home & lifestyle. This post may contain affiliate links. Please read my disclaimer. Welcome! If you're new here, you may want to subscribe join my newsletter and receive a FREE copy of my "5 Easy DIY Beauty Recipes" ebook! Thanks for visiting! Baking is a fun hobby for me. These days, as a busy mom, it doesn’t happen as often as I would like. I recently had the pleasure of making a homemade dutch apple pie after our annual apple picking trip. The pie turned out delicious, but it also reminded me of a time when I made a pie that tasted horrible – swiss chard pie. As a disclaimer, swiss chard pie can be quite tasty, but not the way I made it. It was an honest mistake and one I hope nobody else repeats. I accidentally mistook rhubarb for swiss chard and ended up making a swiss chard pie. Here’s the story of exactly what happened and how it happened. 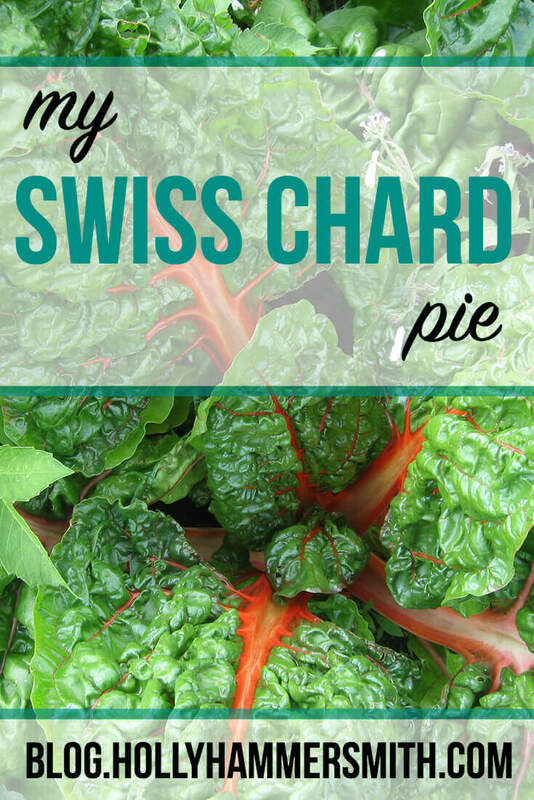 In order to bake a swiss chard pie, you must first confirm the produce you have is in fact swiss chard. This was the first area where I failed when I made a swiss chard pie. We had received our weekly CSA share and I was trying to plan recipes to use up all the ingredients. I saw a handful of leafy greens with thick reddish stalks. Rhubarb, I thought! One of my favorites and it would be perfect for making a rhubarb pie. I went about preparing the stalks, cleaning and chopping them, adding the vital ingredients including sugar and putting them in a homemade pie crust. This was quite the labor of love. This was before I began growing my own rhubarb so it had actually been years since I last saw or tasted rhubarb. • Can You Really Save Money Apple Picking? Just before I placed the top crust on it I to treat myself to a piece of the raw rhubarb, already coated now with some sugar and seasoning. I was remembering eating it as a kid, by the stalk, dipped in sugar. I took one bite and immediately spit it out. What in the world? I ran to my computer and looked up the email I had received detailing each item in our CSA share. Cheese, honey, swiss chard… swiss chard?! Needless to say I pretty much panicked and threw away the sugar-coated swiss chard. I exchanged the filling for some diced apples, a bit of pie seasoning and some sugar. It was a very makeshift “apple pie” but it worked and saved me from wasting a homemade crust. People eat swiss chard in the same way they usually eat beet greens or spinach. Swiss chard can also be used in soups, stews and swiss chard pie. Spinach and kale are popular dark, leafy greens and often overshadow swiss chard. However, swiss chard is good source of vitamins A, C and K along with iron, magnesium and potassium. In addition to swiss chard pie, this leafy green can be used to make other dishes including casseroles, tacos, soups, fresh salad and as a wrapper for edible dishes, according to Food & Wine. What Does Swiss Chard Look Like? Swiss chard is identified by crimson red stalks, crinkled leaves and glossy green leaves, according to Burpee. 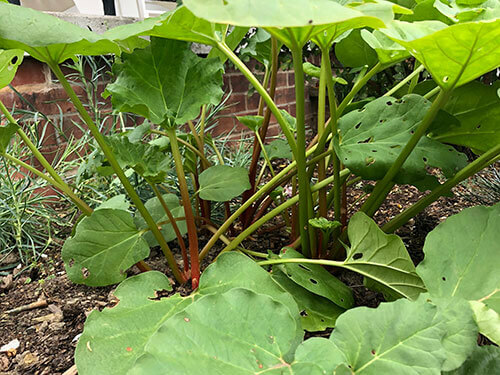 Unlike rhubarb, which has matte (or not glossy) leaves and the leaves are typically not crinkled heavily – when the leaves are mature. As you can see in the photo above the stalks on the left are extremely red in color, in contrast the stalks on my rhubarb plant. Also the leaves on my rhubarb plant are matte (not glossy). As I experienced, swiss chard looks eerily similar to rhubarb. Here are a few photos to show comparison, the rhubarb is growing in my yard. Please take note of the stalks in particular, when compared to swiss chard. Swiss chard is known as an easy to grow plant. Swiss chard is planted in the spring or summer. It usually takes about 60 days for a swiss chard plant to mature. Mature plants are typically 12 to 16 inches in height. Swiss chard grows best in full sun although it will tolerate partial shade. Swiss chard is in harvested from late spring until winter – providing a long growing season. Swiss chard can be harvested once leaves reach five to six inches in diameter or the stalks appear large enough to use. 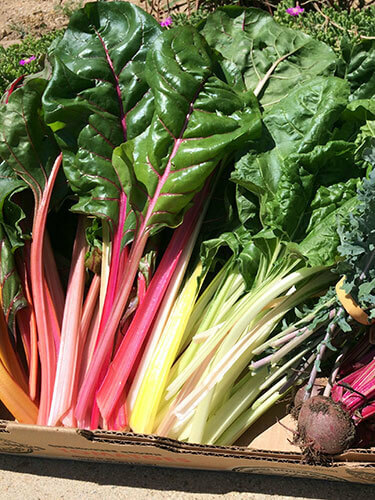 Similar to rhubarb, swiss chard can be harvested by breaking off the outer leaves of the plant at the base. Be careful not to damage other leaves while harvesting. Prior to my experience making a swiss chard pie, the only time I had ever eaten swiss chard was in a sautéed dish prepared by my grandmother. Both the leaves and stalks of swiss chard are edible. If you stumbled upon my post looking for a swiss chard recipe you are in luck. There really is such a thing as swiss chard pie, according to Martha Stewart herself. The pie can be made fresh and eaten on the spot. As mentioned above swiss chard can easily be frozen in the form of a prepared food. In addition to eating it fresh, swiss chard can be blanched and frozen. The stems of the plant can also be picked. Preserving swiss chard is a great option to extend the harvest and to enjoy vegetables during the offseason. Read my home canning post to learn everything you need to know about buying canning supplies. What a disaster my swiss chard pie was, I only have to blame myself. But the good part is that now I know what swiss chard looks and tastes like and how to use it. Someday if I really want to make a swiss chard pie I know there’s a recipe out there to do so. There is such a food as swiss chard pie. It just doesn’t have sugar in it! What’s the worst cooking or baking disaster you can recollect? *This post was originally published in 2012 and has been updated and republished for accuracy and comprehensiveness. Join my newsletter & receive a FREE copy of my “5 Easy DIY Beauty Recipes” ebook! Holly Hammersmith is an independent writer and editor. She blogs about how to keep a healthy home and lifestyle. Topics include wellness, household, saving money, gardening and more. Holly lives in Cleveland, Ohio, with her husband, toddler daughter and rescue dog Lulu. Can’t say I’ve ever done that exact thing, but I’m sure I’ve mixed things up or swapped things out that weren’t a perfect switch. The first few times I used wheat flour I didn’t realize you couldn’t use it exactly like white. Thanks for the smile today. I’ve made rhubarb cookies now 2 weeks in a row. When I gave a plate of the cookies to my neighbor picking up her 1/2 of our CSA crate she informed me it was swiss chard and not rhubarb. Well, the cookies still tasted good! I have to laugh at myself. I just sat down to find out what I had bought to make a rhubarb pie. I didn’t have enough so my good husband drove miles to buy me some more. well, he was smart enough to read he sign, which said chard. he inquired of the produce person, and sure enough, I had bought chard. i’m so glad he checked. I paid 3.95 for a bunch that yielded 1 cup! what would I have done with a 12.00 min pie for my dinner party? thank heavens we can laugh at ourselves! a single plant which looks like red silverbeet…red chard…or rhubarb. how do I know if it is safe to eat? Welcoming Simplicity is a participant in the Amazon Services LLC Associates Program, an affiliate advertising program designed to provide a means for sites to earn advertising fees by advertising and linking to Amazon.com. Copyright © 2019 Hammersmith Writing & Editing, LLC. All Rights Reserved.